Baldor Electric Co., Fort Smith, Ark. Super-E brake motors have been designed to handle the rugged service of conveyor use, while providing NEMA Premium efficiencies, which will use less energy and save electricity. The brake motors have ISR (inverter spike resistant) magnet wire and are inverter-ready. They are designed to provide a 20:1 constant torque speed range when used with an adjustable speed drive. In addition, Matched Performance provides proven test results using Baldor's motor and control. The long-life spring set brake is mounted opposite the drive end, providing a NEMA standard foot mount spacing, allowing drop-in replacement for standard motors and easy conversion to a C-face mounting. The 230/460-volt brake coils are connected inside the motor's conduit box, allowing for separate connection when used with adjustable speed drives. Parker Fluid Control Division, New Britain, Conn. A new Valve Actuation Series of solenoid valves is especially suited for applications in which solenoid valves must predictably and reliably actuate the movement of larger process valves to control the flow of liquids or gases. The Valve Actuation Series includes the 7300 and 2300 lines, which are available in both pipe- and Namur-mounted models. They are constructed of hard-coat anodized aluminum, brass (7300 Series only) and stainless steel, and offer both three-way normally closed models and four-way directional control models. All Valve Actuation Series solenoid valves are compatible with lubricated or dry air, inert gases, and other gases compatible with the materials of construction. They have a pressure range of 30 to 150 psi and a temperature range of -40 to 75°C. The valves can achieve a cycle life of up to 2 million with lubricated air, providing long-lasting dependability for applications. Gurley Precision Instruments, Troy, N.Y. The Model A37 miniature encoder is a 12-bit, single-turn, absolute rotary encoder with optoelectronic technology. The encoder is used in a wide variety of position-sensing applications for the measuring of angles and distances in relatively small envelopes. Mechanical features include a 37 mm diameter aluminum housing, a 3 to 4 mm (0.125-0.25 in.) diameter stainless steel shaft, and precision ball bearings. Output formats include serial, parallel, and multiplexed versions of Gray code or natural binary. Assmann Corp., Garrett, Ind. The company is expanding its overall line of double wall tanks, containment vessels that provide primary and secondary containment in one integral space-saving unit. The expanded line now includes even smaller tanks at 20-, 40-, 65-, 85-, 120-, and 165-gallon capacities. They are designed for storing hazardous and corrosive chemicals inside or outside. Assmann's IMT system consists of a primary inner tank and a secondary outer tank. The secondary outer tank has 120 percent capacity of the inner tank, which exceeds EPA standards for secondary containment basins. The inner tank dome overlaps the outer tank's sidewall, which prevents rain, snow, and debris from entering the secondary containment tank. All are equipped with a molded-in, recessed pump shelf in the top of the primary tank that contains small chemical spills and is designed for installing chemical pumps and metering equipment. These tanks fit through a standard 36-in. doorway. An AutoDrill-designed system helps door and cabinet manufacturers increase their production. By drilling all the holes on a hinge or door at once using multiple spindle drill heads, manufacturers can now perform a multistep operation in a single step. In addition, by drilling three areas at once, performance of the system is increased even more. The fixture is rated for use not only on wood, but on plastics, metals, and various other materials, and could be used for cabinets, steel doors or other production drilling operations. Schroff Products, Warwick, R.I. This subsidiary of Pentair Inc. offers customizable seismic Zone 4 cabinets that are said to provide exceptional protection against shock and vibration. Composed of a rugged, cold roll steel frame with reinforced structural steel corner angles, the Tecnorack Series is useful for heavy-duty, indoor applications in the telecom, security, and defense industries. Available in heights from 15 U to 47 U, widths up to 1,200 mm, and depths up to 1,000 mm, the new Tecnorack Series can be configured to fit a range of specifications. The Series has been tested with a static load capacity of 2,000 lbs. in accordance with NEBS Zone 4 and GR-63-CORE in three manually perpendicular axes: front to back, side to side, and vertically. Dynamic load-carrying capability is 1,600 lbs. Options and modifications that add to the cabinets' versatility include vented sides, custom cutouts, and protection against electromagnetic interference. The EMC/RFI version features a fabric-over-foam gasket made from UL-94HB urethane foam. The doors have a multihinge design and three-point latching to ensure a consistent EMC seal. Animatics Corp., Santa Clara, Calif.
With the Add-A-Motor serial configuration cable, the user can have an entire "off the shelf" servo system solution, including the cables, that is ready to plug and play. The fully molded Add-A-Motor cable connects SmartMotor to SmartMotor in a daisy-chain configuration for serial operation, thus eliminating the need to create custom, multi-axis cable configurations for each SmartMotor application. Add-A-Motor cables are designed specifically to supply dc power and RS-232 communications to multiple SmartMotor 1700 and 2300 Series motors. Add-A-Motor cables, with fully molded connector ends and durable high-flex cable, increase the reliability of SmartMotor installations by reducing the incidence of servo system failure. Each Add-A-Motor cable has a female 7-pin SmartMotor 7W2 Combo-D-sub connector on one end and a female 7-pin 7W2 D-sub connector backed by a male 7-pin connector on the other end to transmit and receive data between SmartMotors. Add-A-Motor cables come in four standard lengths to help eliminate tangled cabling in tight spaces and keep cables organized in serial SmartMotor applications. Standard lengths are 0.3, 1.0, 3.0, and 7.5 meters. Parker Hannifin Corp., Wickliffe, Ohio Parker 781 hose is designed for high-pressure, high-impulse applications and accommodates petroleum-based hydraulic fluids and lubricating oils, water/oil emulsion and water/ glycol hydraulic fluids. Features include neoprene inner tube, four or six spirals of high-tensile steel wire reinforcement, and a constant working pressure of 5,000 psi. Lin Engineering, Santa Clara , Calif. In conjunction with German-based Trinamic Microchips GmbH, Lin is making available the StallGuard. This new technology, capable of sensorless stall detection without the need for an encoder, is for the TMC246 and TMC249 driver chips. The TMC246 is a dual full bridge driver IC for bipolar step motor control. The StallGuard can operate at high temperatures of up to 105°C or at high currents of up to 1.5 amps/phase. Its low current consumption and high efficiency together with the Internal DACs allow for microstepping as well as smart current control that allows for cool motor and driver operation. The device can be controlled via serial interface or via analog/digital input signals. Short-circuit, temperature, under-voltage and over-voltage protection are all integrated. The TMC249 is the high current version of the TMC246. It is able to support up to 75 volts dc. This drive chip can also be used for unipolar step motors. The MicroRay Pro is a portable infrared thermometer for numerous applications and uses in different industries. It is a suitable tool for HVAC monitoring and maintenance to measure temperature easily and quickly. The MicroRay provides laser pinpointing, easily identifying the measured surface area. This tool can prevent temperature-related malfunctions before serious damage occurs, such as in bearings, motors, valves, electrical switches, hot spots, engine performance, floor heating systems, piping, and much more. The tool's temperature reading capability ranges from -5°F to 800°F. Jammes Industrie, Riverside, Calif. The type T-180 plate-bending machine can roll sheet metal into small diameters over long lengths to produce tubes, pipes, and missile bodies. The specifying diameter requires that no tooling machine can be operated without special training. According to the company, the machine can produce 200 parts per hour. MicroMo Electronics, Clearwater, Fla. The company's Faulhaber 4490 brushless motor comes in both the original delta wound version and the new star wound version. The number "4490" means that the motor is 44 mm in diameter and 90 mm long. The 200-watt motor has the combined benefits of the skew-wound System Faulhaber coil as well as a rare earth (NdFeB) magnet. The delta wound version should be considered for higher-speed applications. The star wound version offers a higher torque output to current consumption ratio. Available with the 4490 motors are precision gearheads, encoders, and drive electronics. Merkle-Korff, Des Plaines, Ill. The GF gear motor provides up to 300 lb.-in. of output torque over a speed range of 1 to 30 rpm. Optional features of the 2.25-in. double ball bearing brushless motor include customized output shaft, integral controls, programmable dynamic breaking, and custom speed profiles. Exlar Corp., Chanhassen, Minn. A new 5-in. frame GSX Series unit is now available with T-LAM, the company's efficient segmented motor stator design. This design has 50 percent more force in a smaller package than any competitors and will outlive any comparable-sized ball screw device by 15 times, according to the company. GSX Series actuators combine a brushless servo motor, an inverted planetary roller screw and an encoder/resolver feedback source into a single compact assembly, which eliminates the cost and complexity of a systems engineering approach. The brushless servo design of the GSX series linear actuators allows them to be used in state-of-the-art closed-loop servo systems, where electronic control of positioning and velocity is required. In these systems, position feedback can be provided in a number of different forms to match customer specifications, including resolvers, incremental or absolute encoders, or internally mounted linear position feedback sensors. Dresser Instruments, Stratford, Conn. Liquid fill error that occurs between a digital gauge and diaphragm seal can result in a loss of 0.5 percent accuracy. A sensor diaphragm in the Ashcroft AccuSeal gauge isolator that is almost flush with the bottom of the gauge socket isolates media to prevent clogging. This eliminates error, the company says. The 17-4 stainless-steel sensor diaphragm has a 316 stainless-steel process connector and occupies less space than traditional gauge-and-seal assemblies. Dynaflow Inc., Jessup, Md. DynaSim is a ship-maneuvering simulator that incorporates state-of-the-art models of ship maneuvering and is said to achieve capabilities not found on stand-alone full-mission simulators. It runs Windows-based PCs and has a user-friendly interactive graphic interface. The ship simulator employs modular mathematical models for the various components of the ship—such as hull, propellers, rudders, thrusters, environmental effects (wind, current, waves), and waterway (bottom, pier walls) to achieve a sophisticated and faithful mathematical model for the ship. An additional feature of DynaSim is its ability to tune the mathematical model to a particular ship's evolving characteristics, thus achieving accurate predictions of the motion of that ship. DynaSim can be used to generate multiple ship tracks to evaluate harbor safety from a system perspective and estimate the likelihood of collision for various types of vessels, traffic densities, navigation channel geometries and environmental conditions. Transducer Techniques Inc., Temecula, Calif. Three new system combinations are available, suitable for industrial and OEM force measurement and weighing applications. System GSO/Dpm-3 combines an analog-output panel mount meter that can be scaled to five digits and samples 60 readings per second with a tension and compression gram sensor. The gram sensor is available in capacity ranges of 10 to 1,000 grams. System HSW/Dpm-3 combines the panel mount meter with a tension or compression hermetically sealed load cell, available in a weight range of 1,000 to 50,000 lbs. System TLL/ PHM-100 combines a stainless-steel, in-line tension load cell, available in a 5,000 to 50,000-lb. weight range, with a transducer indicator. 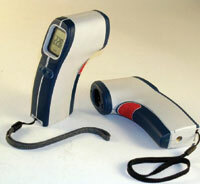 A hand-held indicator captures peak hold within one millisecond. Actiris, a coordinate measuring machine, uses photogrammetry and digital image processing to determine coordinates of points on a workpiece surface. The 37.5-lb. system comprises an optical head, probe, tripod, and wheeled transportation case. The system functions with either Delcan's PowerInspect or industrial measurement software, and features automatic calibration. Reell Precision Manufacturing Corp., St. Paul, Minn. The MH Series constant torque hinges are designed to control motion through 360 degrees of rotation. The hinges deliver 20,000 cycles with no backlash and a spring-back of less than one degree, according to the company. The MH40 hinge is available with specific torque ratings of 15.6, 22.5, 26.1, 29.5, 33 and 36.5 lb.-in. ; the MH20 comes with 1.7, 3.4, 5.2, 6.9, and 8.6 lb.-in. of torque. Hinge applications include medical cabinets, computer peripherals, access panels, industrial enclosures, and equipment guards. Faro Technologies, Lake Mary, Fla. The Gage and Gage-Plus portable coordinate measurement machines are intended to offer small machine shops 3-D measurement capabilities not currently available with less-advanced quality control methods. The machines were specifically created to be convenient for machinists, and intuitive enough for shop-floor personnel to produce faster, more accurate results. Setting up in seconds, each is ready to measure right out of the box, so users can inspect parts, molds, and assemblies directly on the machinery producing them. 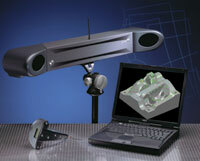 Faro has two different models with accuracy for very high or intermediate precision applications. They are powerful enough for advanced 3-D measurement and statistical analysis. In addition, they automatically record all of the user's measurements and create comprehensive reports. Universal Air Filter Co., Sauget, Ill. Tough Air Filters are designed to protect electronic components that depend on forced-air thermal management to maintain temperature and operation. According to the company, the filters can withstand high temperature and humidity, chemicals, and solvents, and provide EMI/RFI shielding and particulate protection for indoor and outdoor equipment. A rigid, coated polyurethane formulation is incorporated into the filters to sustain an open-pored structure; chromated, epoxy powder-coated or anodized-aluminum frame and grid systems lend sturdiness.